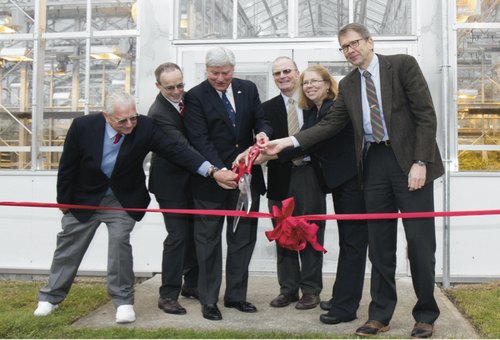 Greenhouse ribbon-cutting at the New York Agricultural Experiment Station, Geneva, N.Y., October 2014. Photo: Rob Way, CALS Communications. It was a year of promises and deliveries, of new partnerships and the research and outreach results those relationships fuel. For Cornell’s New York State Agricultural Experiment Station in Geneva, 2014 will be remembered as a very good year. The state committed $3.4 million to upgrade the Fruit and Vegetable Processing Pilot Plant, part of a $13 million dollar modernization effort for the facility. A $4.7 million upgrade to the greenhouses was celebrated in October. The Northern Grapes Project, led by senior extension associate Tim Martinson, received a $2.6 million USDA grant to continue developing grape growing, wine making and marketing resources for cold climate grape growers. Assistant professor of horticulture Kenong Xu received two grants totaling nearly $2 million to dissect the genetics of acidity and branch angle in apples. Susan Brown, incoming Station director and faculty in the Horticulture Section, was named a 2014 “Women of Distinction” in a ceremony at the State Capitol. Sarah Pethybridge was hired as an assistant professor in the Plant Pathology and Plant-Microbe Biology Section, Steve Reiners assumed the position of associate chair of the Horticulture Section, Anna Katharine Mansfield was promoted to associate professor in the Department of Food Science, and Jennifer Grant was named director of the New York State Integrated Pest Management Program. The Station completed its 10th year of boosting science literacy through a plant science program for the Geneva City School District’s third and fourth graders. The Summer Research Scholars Program hosted 27 students from top universities around the country for immersion in agricultural research. Read all the highlights in the Station’s “2014 Year in Review” available online on the NYSAES homepage: nysaes.cals.cornell.edu.